Why are website goals so important? Have you every wondered why some websites are cluttered full of content and buttons? And then there are the sites that are easy to use and look at, they seem to guide you effortlessly through a pleasing experience. While that may be the case, there’s usually something else underneath that drives the two scenarios. In scenario 1, whoever is driving those types of sites, is driven by FOMO (Fear of missing out) and thinks that not providing every opportunity on every page is going to leak inquiries or sales. ​​​​​​​​​​This fear comes from a lack of courage and not realising every single page on your site is a landing page, and a page that has it’s own goal.​​ They don’t realise they lose as many people as they gain. No one raves to others about their experience. In Scenario 2 the people behind these sites, have clear intentions. They set goals they want to achieve and then step back and look at what that means. It shapes everything that they do moving forward on their site. They might do this subconsciously but it’s there in the end result, clearly showing they cared enough to create goal driven experiences. How does it impact your plan or the end site development? Think of a traditional WordPress, or similar CMS site, that offers up a themed approach to pages and posts. When you create a new page or post it will conveniently for you throw in the default sidebar options you’ve added to the site. With it comes all the extras, images, ads and other inclusions. Within the pages themselves you will see many different calls to action added in. Buttons, links and other distractions to the user. These pages lack any sense of direction. They are typically the lazy persons way to create content in the least amount of time and comply with corporate guidance. A page, post or entire site that thinks differently about the purpose it has both individually as well as collectively has a much better chance of providing something useful. Seth Godin repeats often, ‘who do you seek to serve?‘ and within that simple sentence he challenges everyone to dig deeper, to do the harder things that others won’t do. That’s how you make a ruckus, or a unique point of difference. That’s how you don’t just copy another site. What’s the goal of the site. Refer to the book to get into detail on setting goals, but understand you need primary goals and lesser important goals. Then extend that into the individual page. What is the goal of the page. Not what are ‘the goals’ of the page, but what is the singular goal. Choose one, then once you can lock that in as your key driving point for the page, then you can list any lesser goals. When it comes time to wireframe and scope out the functionality and then ultimately the look of the page, you can always reflect back to the primary goal. Are you doing everything in your power to make the primary goal easy for the person you seek to serve. The key word is service. 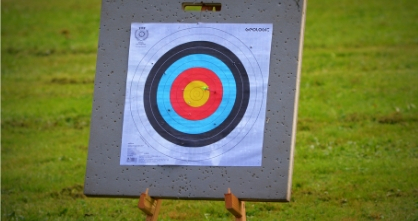 Use the goals to create sites that aren’t just like everyone else. Make them the best they can possibly be. Goals are the umpire that decide what’s in and what’s out between competing departments or bosses. They allow you to stay focused on what you are really looking to achieve, and ensure you don’t just take the easy route. How do you use goals in your website planning and development? I’d love to know.